“Like Dissolves Like,” But How Much? Written by The Editor on February 9, 2018 . Posted in High-School, Post-Secondary. After introducing the concept of “like dissolves like,” sensors can be used to quantify how much solute is dissolved in a solution. Conductivity is a great tool for quantifying the amount of particular types of solute in a solution. Depending on the type of solute, students can “conduct” an experiment that makes them concentrate on concentration. There is a linear relationship between the concentration of an electrolyte and its conductivity. 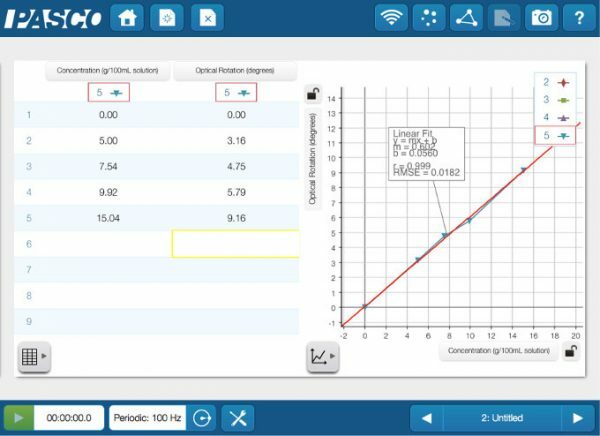 In this activity, based on a lab in Essential Chemistry, the relationship between concentration and conductivity is explored and data is collected with the Wireless Conductivity sensor. The first set of data represents a solution with increasing amounts of salt added. Since salt is an electrolyte, the conductivity is linearly related to the concentration. The second set of data represents a sugar solution. Sugar is soluble in water but, as a non-electrolyte, the concentration cannot be related to the conductivity measurement. Sugar may be sweet, but the conductivity data of sugar solutions is definitely not. Luckily, sugar molecules have a chiral center and are optically active. The amount of optical rotation will depend on the type and amount of sugar present. 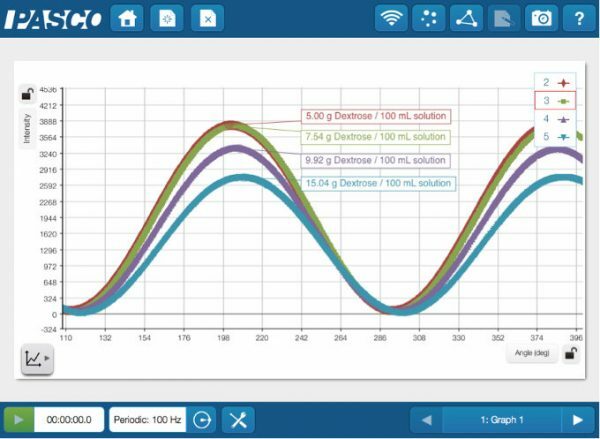 Using a Wireless Polarimeter, you can measure the optical rotation of a variety of sugar solution concentrations. The Polarimeter measures the light intensity vs the angle of rotation. The change in optical rotation is linearly related to the concentration of the sugar solution. Determining the amount of solute in a solution is an important part of any chemistry class. 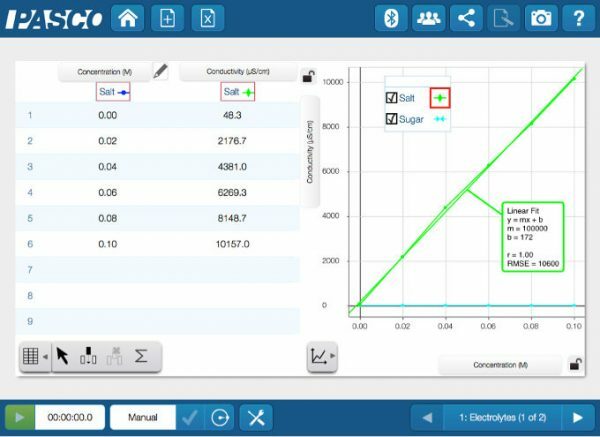 Having the appropriate sensors, and knowing the properties of the solutes and solvents, gives students the tools they need to quantify the concentration of a solution.